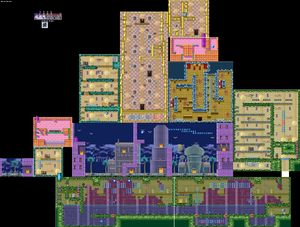 Arabian Night is the second level of the Sapphire Passage in the Game Boy Advance game Wario Land 4. It is an Arabian-themed level, set in an abandoned Arabian palace and features flying carpets in which Wario can fly on to reach other places. This level is separated into two areas: an inside and an outside. Doors throughout the level link each inside and outside area. This is the only level where the Mayu Bird makes its appearance; if Wario touches it, it will mysteriously fly away. The Onomī, a vicious axe-wielding mummy also makes an appearance here. Inside the palace, there are two enemies, Beezley and Minicula, which allows Wario to get Keyzer. This level's CD is called The Errand and once collected, it can be played in the Sound Room. Arabian Night resembles Agrabah from the 1992 Disney animated film, Aladdin. This page was last edited on April 12, 2019, at 23:52.